The SafeD carabiner is made from lightweight aluminum and is offered in 2 different styles; an autolock and a twistlock. 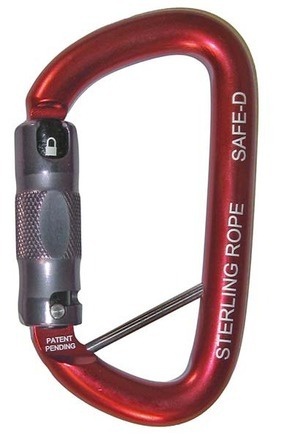 The autolock, also known as a 3-stage carabiner, is red with a black gate and requires the user to pull down on the gate sleeve before twisting. The twistlock is a 2-stage red carabiner with a gold gate and only requires the user to twist the gate sleeve before opening.